Hi, I am interested in your 1969 Chevrolet Chevelle (stock #4590-CHA) listed on Autotrader for $42,995. I'd like to get more information about this vehicle and confirm its availability. A 1969 Chevrolet Chevelle Malibu convertible will always make a great first impression. After all, the factory drop tops of this muscle car legend are rare. But when you can have one with proper SS tribute features, A/C interior, cool color combo, and a big block under the hood, then you know youre looking at the standout among standouts. Nothing but red and black is exactly how you want a muscle car to look, and so this has been prepared that way. The upgraded fiery paint is part of a later respray. So while its not perfect, it still has that unbeatable clear coat shine every time you take this convertible out for a cruise exactly what you want in a sunshine-friendly drop top. With the black SS stripes painted on, it makes for a fantastic coordination with the blacked-out grille, blacked-out tail panel, sporty SS wheels, and power convertible top. So this one really does know how to command attention. The form-hugging bumpers have a mirror-like shine, and it matches nicely with the half chrome covers on the headlights. Plus, the larger cowl induction hood is the perfect upgrade in aggression. With the flip of a switch, the black electric folding roof reveals a nice black interior so this drop top has a great overall appearance with the top up or down. Everyone loves to see bucket seats and a center console in a muscle machine like this, and it comes complete with the iconic horseshoe shifter. This convertible feels nice inside with the carpets, door panels, and dash all retaining their deep, dark appearance. The driver gets the factory three-spoke sports steering wheel that gives a commanding view of everything. This includes the upgraded gauge package with tach. This is a terrific cruiser with everything from an auxiliary readout trio to an upgraded AM/FM/CD stereo for the best in top-down tunes. And since youll want to cruise as long as possible with the roof off, the factory air conditioning is blowing nice and cold. This is the kind of motor that will make you proud to lift the hood at car shows. The big block 396 cubic-inch V8 is exceptionally well presented with its orange block paint, shining valve covers, and cross-flags air grabber. If you look closer, you can spot useful upgrades such as, the Edelbrock four-barrel carburetor, new plug wires, and a new electronic ignition. The long tube headers add even more power as they also contribute to the rumble of the dual exhaust. The total power package reliably gets to the ground via a stout GM three-speed automatic transmission. Plus, control stays well in hand thanks to power steering, power brakes, and raised letter Cooper Cobra tires at all four corners. 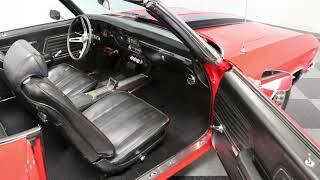 Chevrolet only built 8,950 Chevelle drop tops in 1969, making them a very rare commodity nearly a half-century later. So to find one so nicely presented with a growling V8 under the hood is the kind of treat that doesnt come around very often. Dont miss out, call today!